NEW ORLEANS – Breaking from a recent trend the NCAA Division II Cross Country Regional Rankings that were released by the U.S. Track & Field and Cross Country Coaches Association (USTFCCCA) saw much more movement compared to rankings in the recent past. The dust is starting to settle after one of the biggest weekends in the sport this season as quality meets were found throughout the country this past weekend. On the men’s side five of the eight regions saw change to the top-five teams while six regions experienced the same movement on the women’s side. A new No 1 team was also selected this week with a shake up occurring atop the Men’s Southeast Region. Keep reading for more information on the rankings, including overviews of each region as well as the full top-15 lists at the bottom of the post. The USTFCCCA Regional Cross Country Rankings are determined subjectively by a single member coach in each respective region. The regional representative is tasked with weighing returning teams’ strength with current season results (if applicable) in determining predicted team finishes at the NCAA Regional Championships. The top-two teams on both the men’s and women’s side of the Atlantic Region remained the same while there was movement throughout the No. 3-5 spots. The top-three on the men’s side all remained the same as it was made up by No. 1 Edinboro, No. 2 Shippensburg and No. 3 Charleston. No. 4 Lock Haven improved two spots to move into the top-five while No. 5 Kutztown joined them after a one-spot improvement. For the women, Edinboro remained No. 1 while Shippensburg was right behind them at No. 2. No. 3 Kutztown (up one) and No. 4 Seton Hill (up three) each improved from its previous ranking while No. 5 West Chester rounded out the top-five. The Central Region stuck to its stubborn ways with no changes to the top-five on the men’s or women’s side. The men were led by No. 1 Augustana (S.D.) which was followed by No. 2 Missouri Southern, No. 3 Sioux Falls, No. 4 Minnesota State and No. 5 Neb.-Kearney. All top ten teams in the region remained in their ranking from the week before. For the women, U-Mary led the way at No. 1 and was trailed by No. 2 Augustana (S.D. ), No 3 Oklahoma Baptist, No. 4 Pittsburg State and No. 5 Southwest Baptist. 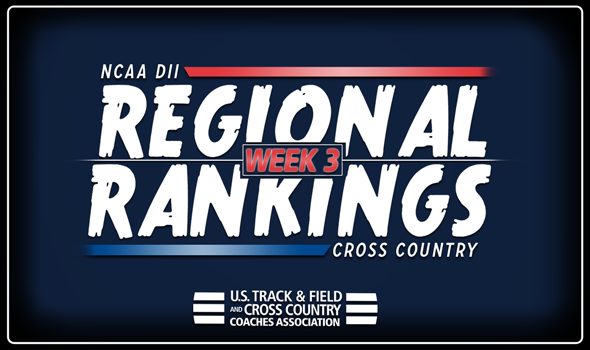 There was slight change across the East Region on the men’s side while the women’s top-five remained the same. American International College and Stonehill remained at No. 1 and No. 2 for the men. Southern Connecticut moved up two spots to No. 3 while No. 4 Southern New Hampshire and No. 5 Roberts Wesleyan made up the rest of the top-five. The women’s top-five remained the same as No. 1 Stonehill, No. 2 Roberts Wesleyan, No. 3 Merrimack, No. 4 Assumption and No. 5 Southern New Hampshire all remained put. The Midwest Region was flip-flopped with the East as the men’s top five stayed the same while the women saw movement at the top of the chart. The men held pat with No. 1 Grand Valley State, No. 2 Southern Indiana, No. 3 Saginaw Valley, No. 4 Walsh and No. 5 Malone. Grand Valley State remained the No. 1 team for the women but No. 2 Walsh and No. 3 Hillsdale traded place with one another while No. 4 Michigan Tech and No. 5 Drury each saw one spot improvements from the previous installment of rankings. There was change in the South Region on both the men’s and women’s side of things. The top two teams in No. 1 Lee (Tenn.) and Embry-Riddle (Fla.) remained the same for the men while No. 3 Mississippi College improved three spots to move into the top-five while No. 4 Alabama-Huntsville and No. 5 Florida Southern each dropped one. For the women, Lee (Tenn.) stayed at No. 1 while No. 2 Tampa and No. 3 Embry-Riddle (Fla.) also remained the same. Florida Southern jumped up two spots into No. 4 while No. 5 Union (Tenn.) completed the top-five. The top-five of the men remained the same while two women’s teams traded places. The men were lead again by No. 1 Adams State who was followed by No. 2 Colorado Mines, No. 3 Western State, No. 4 CSU-Pueblo and No. 5 Dallas Baptist. The top of the women’s rankings also stayed the same as No. 1 Adams State took the top spot with No. 2 Western State and No. 3 Colorado Mines following. No. 4 UC-Colorado Springs and No. 5 Dallas Baptist traded spots to round out the top-five. There’s a new No. 1 men’s team in the Southeast Region as Mount Olive claimed the top spot. No. 2 Queens (N.C.) and No. 3 Augusta made up the rest of the top-three. UNC-Pembroke shot up six spots on the chart to come in at No. 4 while Georgia College saw a four-spot improvement to take No. 5. The women’s side was less exciting as No. 1 Queens (N.C.) remained the top team in the region while Mount Olive followed them in No. 2. No. 3 North Georgia and No. 4 Anderson (S.C.) traded spots from the previous rankings while Wingate held tight at No. 5. The West Region saw a little bit of movement on both sides to close out this week’s rankings. For the men, Chico State stayed at No. 1, Western Oregon remained at No. 2 and Simon Fraser held at No. 3 while No. 4 Cal Poly Pomona and No. 5 Alaska Anchorage traded spots at the back end of the top-five. On the women’s side Chico State was also the No. 1 unit and was trailed by No. 2 Alaska Anchorage and No. 3 Simon Fraser. No. 4 Azusa Pacific and No. 5 Seattle Pacific each improved one spot from its previous rank. MEN | WOMEN Dec. 1: NCAA DII Champs, Pittsburgh, Pa.